“New” is not a giant sequoia tree – some sequoias are over 1,000 – 2,000 years old. Or, the Yosemite Mariposa Grove, preserved and set aside for public use by Congress and President Lincoln in 1864. What is new – re-designed trails so future generations can walk through a thriving forest of the largest trees in the world. Labor Day weekend we headed up to Yosemite and spent a full day hiking around the recently re-opened Mariposa Grove. Here are highlights, suggested trails, and travel tips for an enjoyable family visit. 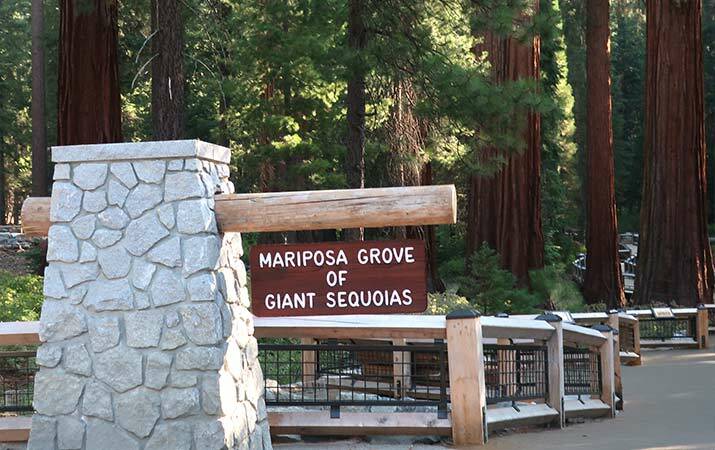 To visit the Mariposa Grove, park in the parking lot at the Welcome Plaza. There are volunteers to answer questions, a gift shop, restrooms and shuttle bus stop. Take the shuttle bus to the grove, it comes about every ten minutes, and operates in summer from 8am to 8pm. Tip: Come early to get a spot in the parking lot, which typically fills up by mid-morning in summer months. At the shuttle bus arrival area are restrooms and drinking water to fill up water bottles. Walk the wide level trail, it’s easy for everyone in the family (and stroller friendly). 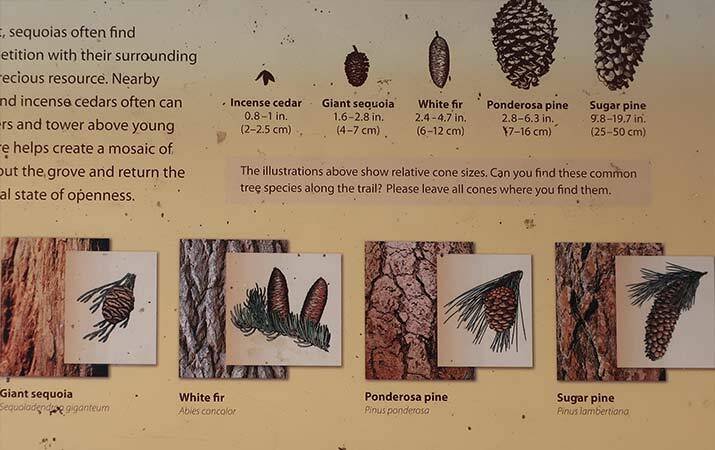 In the very first section are informative signs about stages of life of a sequoia, ecology of the grove, and Native American lore. At the Fallen Monarch tree (it fell down three hundred years ago), not only will kids see the root system of a giant sequoia, but lying on it’s side, it really provides a view of just how tall it was. Grizzly Giant – Estimated to be 1,800 years old and one of the oldest trees in the grove, 200 feet tall (61m), it’s also one tubby tree – 31 feet diameter at the base. High up, look at the massive branches coming out of the trunk – these branches alone are bigger than normal trees! California Tunnel Tree – In 1895, a tunnel was cut through the tree, and cars were driven through it. Today, take all the photos you want, then have fun walking through the tree. 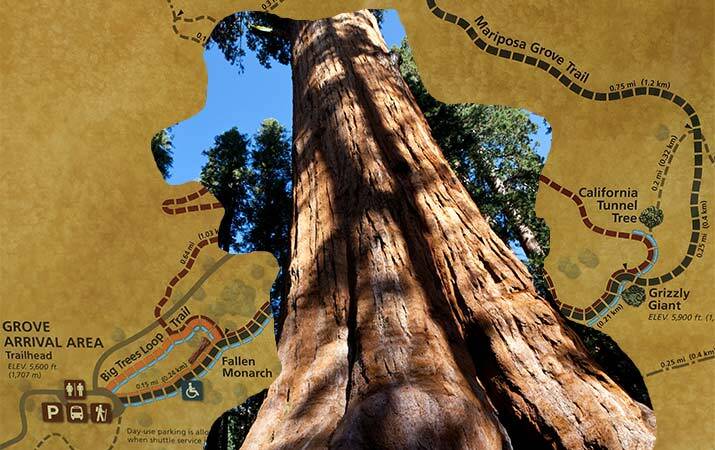 If you only have time to go as far as the California Tunnel Tree, going back to the shuttle area, at the Fallen Monarch tree take the Big Trees Loop trail for a different view of more magnificent sequoias. Tip: In the lower grove, most of the named trees have wooden fences at the base of the tree and signs that say “Stay off.” When people ignore these signs, it injures the tree and destroys new forest seedlings. With older kids and teens, continue hiking up the Mariposa Grove Trail, past the Faithful Couple (twin trees that grew together) and Clothespin Tree (looks like an old-fashioned wooden clothespin), up to the Mariposa Tree. At this point, keep going on the wide Mariposa Grove Trail, or turn right on the narrow dirt trail to the Mariposa Grove Cabin (.04 mile). What an amazing trail, groups of towering sequoias, scads of sequoia cones on the forest floor, yellow monkeyflowers in the meadows, green leaf manzanita shrubs with pinkish flowers. This unnamed trail comes out at a wooden building (these are the only restrooms at the upper section of the grove). We followed the Guardians Loop Trail north to the Mariposa Grove Cabin. Around the cabin, notice all the sequoia seedlings, sprouting at different heights. It’s no easy matter for a sequoia seedling to survive. When the seed has just sprouted, it can be eaten by insects, or killed by drought or high heat. Even up to four hundred years, the tree may not thrive, due to lack of sunlight. As a result, sequoia cones produce more than 300,000 seeds every year, to improve the odds that some seeds will grow into a mature tree. We hiked all the way out to Wawona Point, for a look at of the Wawona meadow below and mountain ridges in the distance. Wawona Point isn’t as spectacular as the valley panoramas from Glacier Point; you may want to spend more time exploring trails the forest. On our way back down to the shuttle pickup, we followed the scenic Guardians Loop Trail, stopping to see the Telescope Tree, hollowed out by fire, then returning down the Mariposa Grove Trail to the shuttle bus stop. In the Mariposa Grove, keep an eye out for wildlife. 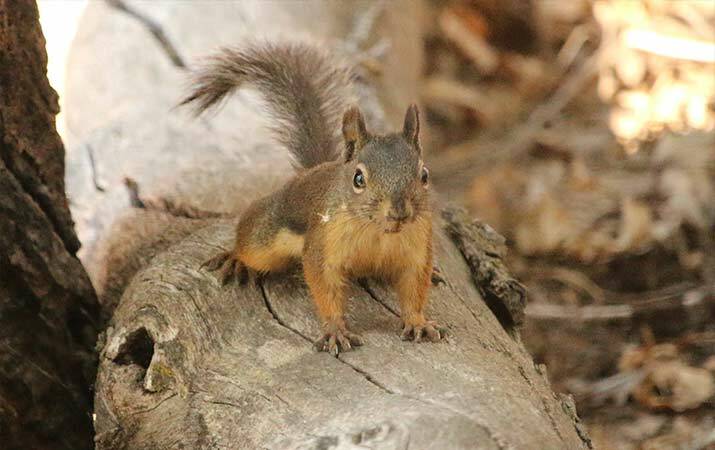 Most easily spotted are chickarees (also called Douglas squirrels, photo above), ground squirrels, and chipmunks running around. 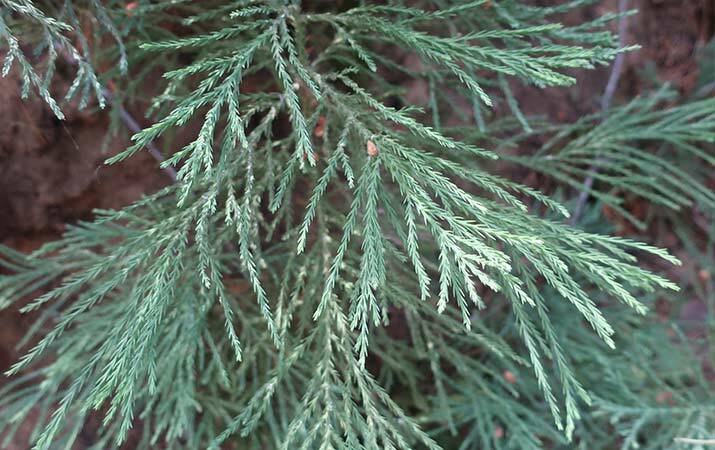 Chickarees like to eat sequoia cones, and help disperse the seeds. Tip: Do not feed the squirrels and chipmunks, even when they come up to pose so nicely for a photo. We also saw a young mule deer, strolling through the forest. There were also reports of a bear cub, but remember if there’s a cub, mother bear is not too far away. Do not approach any bears! The forest is filled with birds – our favorite were the black and white mountain chickadees (flying too fast for us to take any photos). 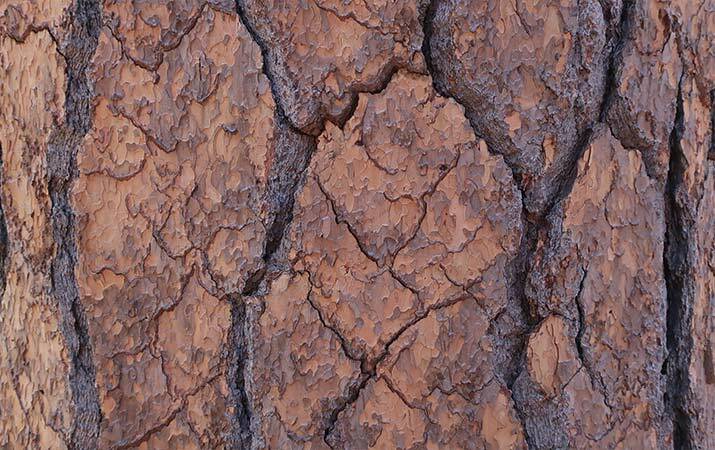 Woodpeckers make their home pines and sequoias the forest, look for the holes in the bark. We spotted a white-headed woodpecker high up in a tree. The Mariposa Grove is more than giant sequoia trees – there are also towering sugar pine, ponderosa pine and white fir trees. 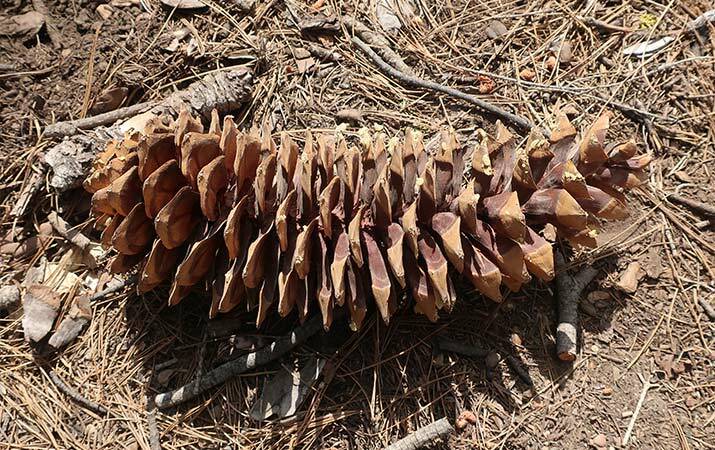 The majestic sugar pine, which grows up to 230ft high, has the biggest pine cones in the world. White fir pine often has bright green lichen growing on the tree. 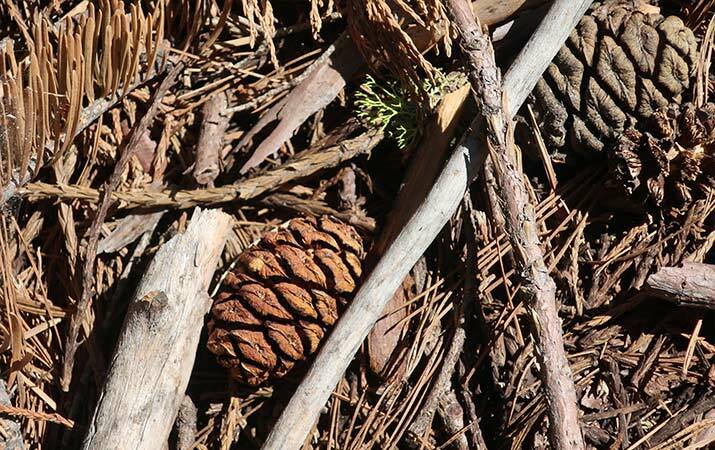 Ponderosa pine bark looks like a jigsaw puzzle. Parking – Go early to visit the Mariposa Grove. In summer (Memorial Day to Labor Day) the parking lot is crowded, usually filled up by mid morning. When the lot is full, you won’t be able to park and take the shuttle. Tip: If the lot is full, come back later in the afternoon, and the parking lot may have spaces available. Bring plenty of water – Water is available at the parking lot and shuttle arrival area to fill up water bottles, but inside the grove itself, there’s no drinking water. Summer days can be hot, bring all the water or drinks you need for your visit (remember, your car is back at the parking lot, not close by). Restrooms – Restrooms are available at the shuttle arrival area, and at three locations inside the grove (marked on the map). Encourage kids to use the facilities before you start up the trail. Take out your trash – There are no trash cans inside the grove. Bring a bag to collect any trash from picnic lunches, snacks, drinks etc. And don’t litter (no toilet tissues by the side of the trail please). Trails – Map and signs are posted along the trails, so you know where you are. Also, Yosemite Guide has a paper map of the Mariposa Grove – bring this map with you for quick reference during your visit. There are miles of trails throughout the grove. In the upper grove, the Guardians Loop Trail is our favorite trail. 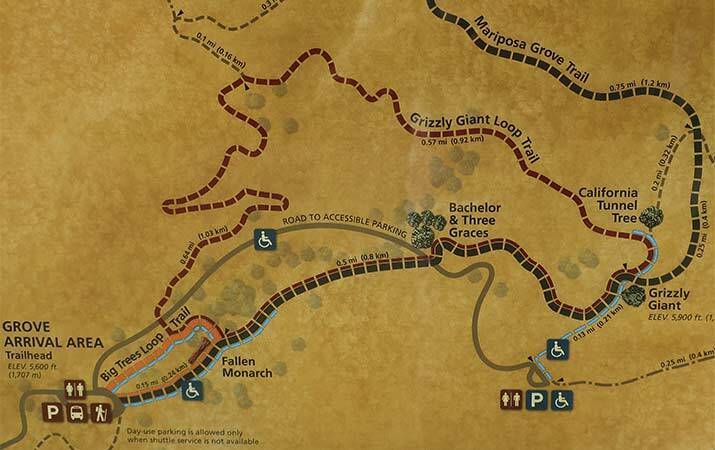 We don’t really recommend the Grizzly Giant Loop Trail. It has a lot of up and down, very few sequoia trees, hot and dusty in late summer. The Mariposa Grove Trail ends at Wawona Point, 3 1/2 miles from the trailhead (7 miles round trip). Rather than hiking out to Wawona Point, we’d suggest driving to Glacier Point, with spectacular views of Yosemite Valley, Half Dome and waterfalls. Don’t feed the animals – Especially squirrels and chipmunks love to come out and pose, but do not feed the animals or birds “people food” – it’s not healthy for them. In the lower grove, to preserve the giant sequoias, next to the trail are wooden barriers to prevent visitors from standing right next to the base of the tree, which will injure these ancient trees and stomp on new seedlings trying to get a start. Signs say “Give plants a chance – Stay Off.” Please don’t follow the bad behavior of tourists we observed leaping over these fences to take their photos. 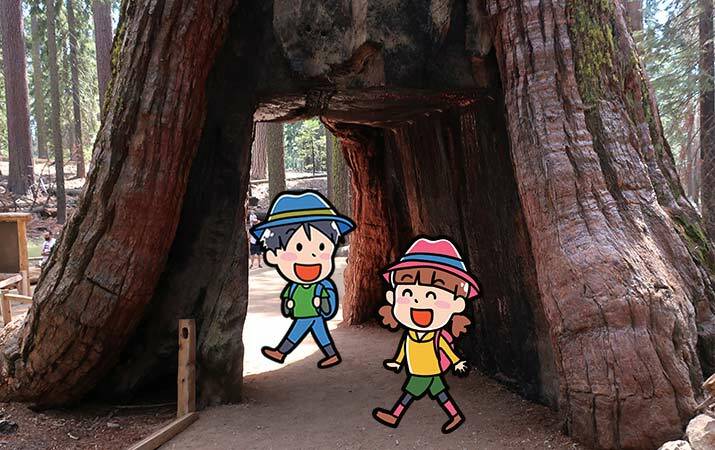 For photos right next to a giant sequoia, California Tunnel Tree is your best best – go up to the tree, then walk through it. In the upper grove is the Telescope Tree, fire has hollowed out the tree, but it still stands. Stand inside the sequoia and look up to the sky. Fun places to stay – The Mariposa Grove is located next to the southern entrance to Yosemite National Park. To visit the grove, the most convenient hotels are located in Wawona (Big Trees Lodge), or outside the park in Fish Camp and further down Highway 41 in the town of Oakhurst. All the details in our list of Travel for Kids Yosemite family hotels. This past summer, we re-visited both the Redwood Coast, and this Mariposa Grove in Yosemite, re-opened after a three year restoration of the grove. 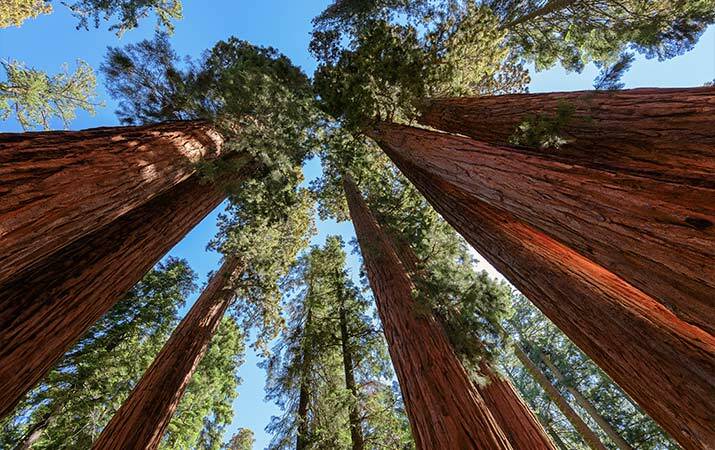 The only locations in the world to see coast redwoods and giant sequoias are in California. In 1903, John Muir and President Teddy Roosevelt slept under the Grizzly Giant tree in the Mariposa Grove on their camping trip in Yosemite. John Muir said, “They are the largest living things on earth. They never stop growing – unless they are cut down.” Theodore Roosevelt went on to protect America’s wild lands, creating national parks, wildlife sanctuaries and national forests. 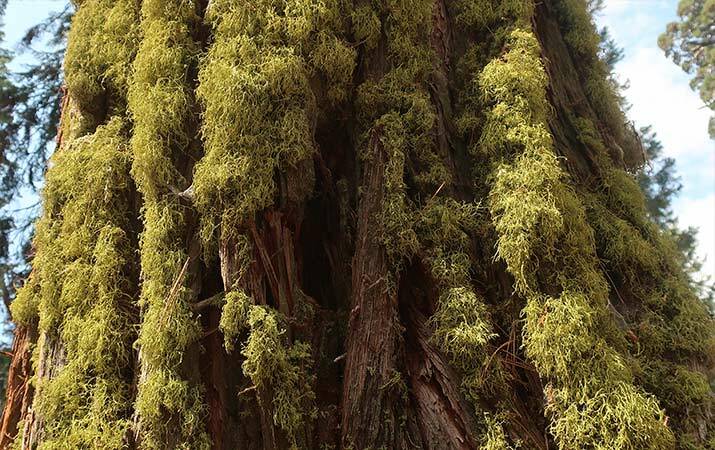 Due to the actions of concerned citizens, elected representatives and past presidents of the United States, the forest habitats of the magnificent redwoods survive. These conservation efforts began over 150 years ago, and are ongoing today. For more places to see the giant sequoias, in Yosemite National Park are also the smaller Tuolumne Grove and Merced Grove, near Crane Flat. 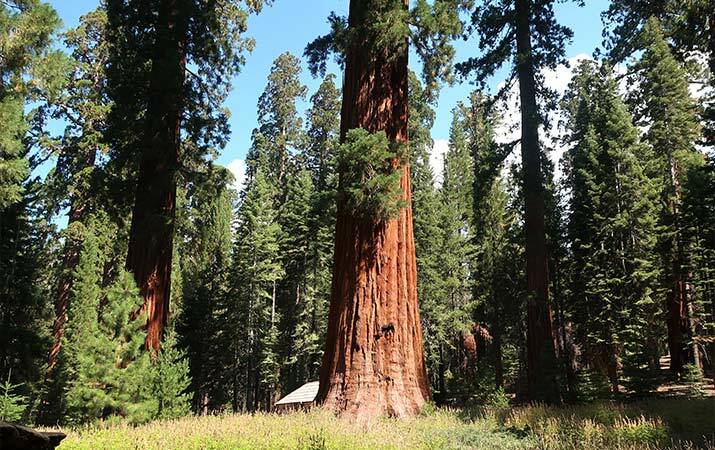 The largest and oldest giant sequoias are found in Sequoia National Park and Kings Canyon National Park, further south in the Sierra Nevada mountains.